Translocation mutation is also termed as chromosomal translocation, translocation chromosomal mutation, DNA translocation, or simply translocations. 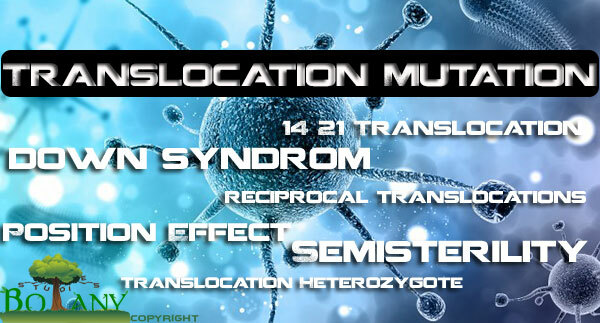 Basically, translocation mutation involves the movement of a segment of a chromosome to a new place in the genome. The translocation may occur within a single chromosome. if the chromosomal translocation occurs between two non-homologous chromosomes. this condition is known as Reciprocal Translocation. The arms of two non-homologous chromosomes come close to each other so that the exchange is facilitated. Two breaks are required in translocation which involves ends of chromosomes, while four breaks are required in translocation which involves internal segment of the chromosome, two in each chromosome. The genetic information is not lost or regained as a result of translocation mutation. Rather there is only a rearrangement of genetic material. The presence of DNA translocation does not therefore, directly alter the viability following fertilization. Translocation mutation, same as chromosomal inversion may also produce position effect (If the expression of a gene is altered as a result of its relocation, a change in phenotype may result. Such a change is called Position Effect) because they may realign certain genes in relation to other genes or to heterochromatic area. This exchange does, however create new genetic linkage relationship which can be detected experimentally. In Fig: 1.1, homologues heterozygous for a reciprocal translocation are shown to undergo unorthodox synapsis during meiosis, resulting in a cross-like (+) configuration. As with inversions, genetically unbalanced gametes are also produced. 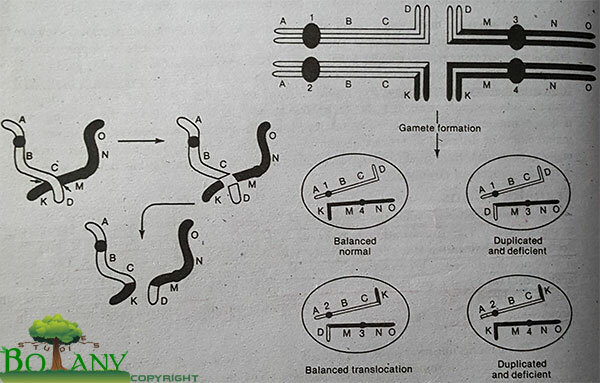 In the case of translocation mutation, however, aberrant gametes are not necessarily the result of crossing over. To see how unbalanced gametes are produced, focus on the homologous centromeres in the Fig: 1.1. According to the principle of independent assortment, the chromosome containing centromere 1 will migrate randomly towards one pole of the spindle during first meiotic anaphase; it will travel with either the chromosome having centromere 3 or centromere 4. The chromosome with centromere 2 will move to the other pole along with either the chromosome containing centromere 3 centromere 4. This results in four potential meiotic products. The 1, 4 combination contains chromosomes uninvolved in the translocation. The 2, 3 combination, however, contains translocated chromosomes. These contain a complete complement of genetic information and are balanced. The other two potential products, the 1, 3 and 2, 4 combinations, will contain chromosomes displaying duplicated and deleted segments. When incorporated into the gametes, the resultant meiotic products are genetically unbalanced. If they participate in fertilization, lethality is the usual result. Therefore, only about 50% of the progeny of the parents heterozygous for a reciprocal translocation survive. This condition is called Semisterility. Fig: 1.1: Origin, Synapsis, and gamete formation of a single reciprocal translocation: (a) Possible origin of a reciprocal translocation; (b) Heterozygous pairing and gamete formation. During transition from the diplotene stage to diakinesis in meiotic prophase I, the chiasmata terminalize as the chromosome begins to pull apart. 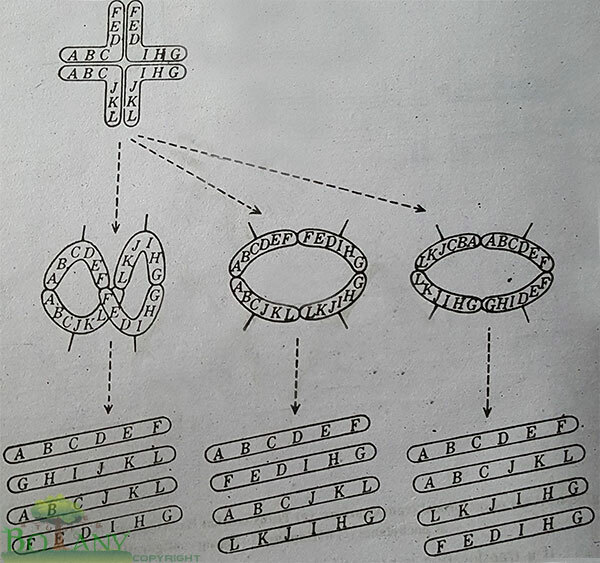 When non homologous chromosome pairs contain a series of reciprocal translocations, chromosome rings may be produced. The pairing configuration in this situation becomes quite complex. Depending on alignment of centromere pairs and the position of chiasmata various configurations may be seen prior to the first anaphase. In Fig: 1.2: an alternating alignment has occurred, resulting in three rings. Many other variations have been detected cytological in a variety of plants. If a translocation is present in one of the two sets of chromosomes, this will be a Translocation Heterozygote. In such plants, the normal pairing into bivalents will not be possible in translocated chromosomes. Due to pairing between homologous segments of chromosomes, a cross-shaped (+) figure involving four chromosomes will be observed at pachytene, The genetic techniques for studying translocations will be more easily understood when the cytological phenomena produced by translocations are known. Suppose that two chromosomes having respectively the genes ABCDEF and GHIJ KL exchange sections and give rise to translocation chromosomes ABCJKL and GHIDEF. The individual formed will be a translocation heterozgyote. Since the chromosome paring at prophase is caused by specific attraction of homologous sections containing allelic genes, a translocation heterozygote may be expected to produce a cross-shaped configuration and this has actually been observed in pachytene chromosomes of translocation heterozygote in Maize. Occurrence of crossing over in each of the four arms of the cross will result in formation of chiasmata in each arm. Instead of bivalents, Quadrivalents, a group of four associated chromosomes; each member of the group being partially homologous to two other chromosomes in the group, is formed. The quadrivalents will appear in the form a Ring or Circle at diakinesis and at metaphase I. The ring or circle may be Twisted or Open. 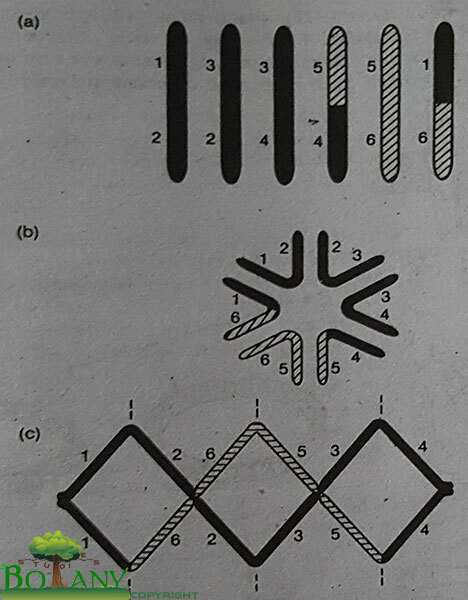 If chiasmata fails to be formed in one arm of the pachytene cross, the ring is transformed into an Open Chain of four chromosomes. Such rings were observed in Datura, Maize, Wheat, Peas, etc. These gametes carry certain genes twice (duplications) and do not have some genes (deficiencies). In most plants, pollen grains containing deficiencies and duplications are inviable and are aborted. Such pollen grains appear empty and shriveled and can be distinguished easily from the pollens having normal chromosomal complements. Embryo sacs with chromosome duplications and deficiencies may also abort. The plants heterozygous for translocations may produce fewer seeds than normal and such plants appear Semisterile. Semiterility may also be produced by lethal genes as well. The first case of translocation round in Oenothera, which was originally described as a mutation by de Vries. Later on translocation heterozygotes were located frequently in Tradescantia, Datum, Maize, Wheat, etc. Presence of translocation heterozygosity can be detected by presence of semisterility and low seed set. This can be confirmed at meiosis by quadrivalent formation. Numerous translocations were revealed in Human Population as early as in 1959. One common type of translocation involves break at the extreme end of the short arms of two non-homologous chromosomes (acrocentric chromosomes). These small segments are lost and the larger segment fuse at their centromeric region. This type of translocation produces a new, large submetacentric or metacentric chromosome and is called Centric Fusion Translocation. This aberration may produce only minor deficiencies and, in many cases, the affected individual may survive. This type of translocation was first discovered in 1959 in an abnormal child who was mentally retarted and suffered from severe spinal malformations. The condition was named Polyssdyspondylie. Karyotypic analysis showed that the child’s cell nuclei had only 45 chromosomes because of centric fusion of small acrocentric chromosomes of G-group and large acrocentric chromosomes of D-group, Deletions occurring during this fusion are apparently responsible for this phenotype. A similar translocation accounts for cases in which Down’s Syndrome is inherited or Familial. The instances of Down’s syndrome are due to trisomy 21. This chromosomes result from non-disjunction during meiosis of one parent. The down syndrome typically is caused by the existence of a part of third copy of chromosome 21 or by all. Down syndrome symptoms includes the reduced or poor muscle tone. The neck stature of the child will be short. Another side effect of down syndrome is the presence of excess skin at the back of the neck. The child has a Flattened face and nose with small head, ears, and mouth. His/her eyes are slanting upward. Trisomy accounts for 95% of all the cases of Down’s syndrome. In such cases, the chance of some parent producing a second affected child is very low. However, in about 5% of families with a Down child, the syndrome occurs in a much higher frequency over several generations. This is called Familial Down Syndrome. Cytogenetic studies of the parents and their offspring from these unusual cases have explained that one of the parents contains a 14 21 DIG translocation, i.e., one parent has majority of the G-group chromosome 21, translocated to the D-group chromosome 14. This individual has only 45 chromosomes, but apparently has a nearly complete content of genetic information. During meiosis, one fourth of individual’s gametes will have two copies of chromosome 21; a normal chromosome and a second copy translocated to chromosome 14. When such a gamete is fertilized by a standard haploid gamete, the resultant zygote has 46 chromosomes but three copies of chromosome 21. These individual exhibit Down’s syndrome. Other potential surviving offspring contains either the standard diploid genome a translocation or the balanced translocation like the parent. Both cases result in normal individuals, but the surviving offspring of the latter have a 1 in 3 chance of exhibiting Down’s syndrome. Knowledge of translocations has allowed geneticists to resolve the seeming paradox of an inherited trisomic phenotype in an individual with an apparent diploid number of chromosomes.